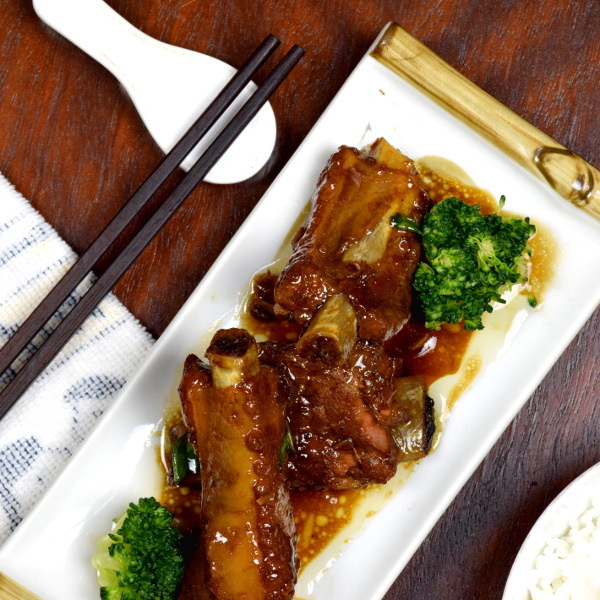 Chinese pork ribs are so tender that the meat is almost melting off from the bone! It is called Wuxi Pork ribs (無錫排骨), the signature cuisine of Wuxi, a town in the Jiangsu 江蘇 province of China. 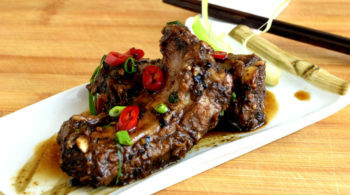 This article is all about how to cook this famous Chinese pork ribs, characterized by the sweetness of rock sugar, sourness of the red vinegar 镇江红醋 and the flavor of Shaoxing wine. The braising liquid is cooked down and caramelized into a thick, luxurious red sauce, which enrobed the ribs within. Be prepared for prolonged braising, and you will be rewarded with the seductive flavor of this culinary wonder. Ask your butcher to cut the pork ribs crossways into long pieces. I suggest you ask your butcher to cut the ribs into single bones, square pieces. If is tough to do it at home as it requires a sturdy butcher cleaver. You can use spareribs (meatier) or back ribs (smaller but more tender) for this recipe. Generally, I prefer back ribs as it is the more meaty one for this recipe. Step 1- Prepare the pork ribs for browning. Add a small amount of salt to the pork ribs and marinate overnight. Marinate helps to enhance the flavor of the pork ribs. I also marinate the lean pork overnight with salt in another recipe- Cantonese Porridge with Lean Pork. Meat treating in this way can still retain the saltiness after prolonged simmering. In general, the amount of salt required is one percent of the ribs by weight. In this case, I use 10g (2 teaspoons) for one kg of pork ribs. There is an alternate way to do it. 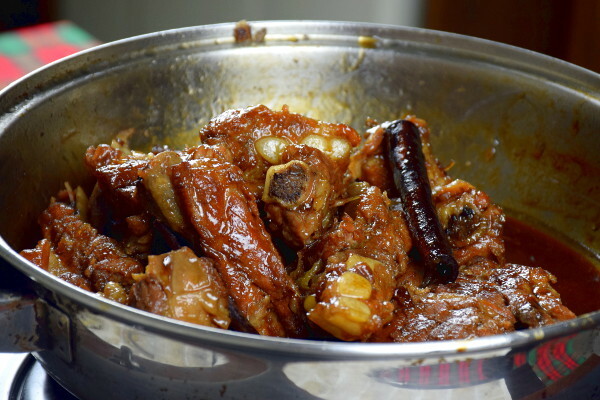 Some cooks prefer to place the ribs in boiling water and blanch them for a few minutes. Remove and drained. This step will help to remove the impurities and the porky smell of the ribs. You can do this after marination, as a few minutes of blanching will not remove the salt that penetrates deep into the ribs. You can skip this step by just rinsing the ribs under running water if it is fresh and no unacceptable smell. Red yeast rice renders a beautiful red hue to the ribs. You can extract the color by soaking the rice in hot water for fifteen minutes. Discard the rice, and add only the colored water to the braising liquid. Alternatively, tie the red yeast rice in a cheesecloth bag before adding to the braising water. Remove the bag when the ribs become tender. Red yeast rice (红曲米, Monascus Purpureus) is traditionally used by the Chinese chef to improve the color of a variety of dishes. It is also used in our Chinese Roast Chicken recipe. You can purchase red yeast rice in most of the Chinese medical halls and grocery shops in Asia. Omit it if you cannot find it as it will not affect the taste. However, the color will not be as red as you expected. There are some specific aromatics and spices for Wuxi pork ribs. Let’s take a look at each of them. Ginger. Ginger can remove any off-putting ‘poky’ smell. If you have a choice, use old ginger instead of the younger for better flavor. Some cooks prefer to slice the ginger, and others cut the ginger into small dices for sautéing. Scallion. Scallions and ginger always used side by side in Chinese cooking. The white part of scallions has better flavor, which is used for sautéing in this recipe. You can add some green sections if you do not have enough white sections. Reserve some chopped scallions to sprinkle on top of the ribs for garnishing. 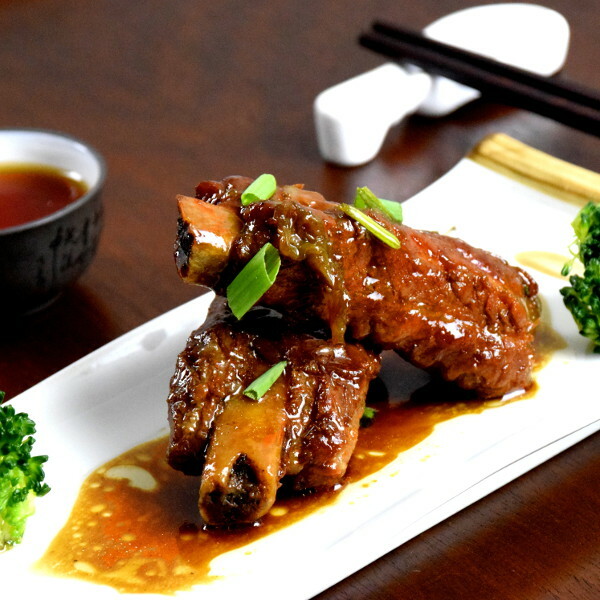 The signature flavor of Wuxi style Chinese pork ribs is from the triumvirate of vinegar, sugar, and wine. There are numerous variations of braised pork ribs even in Wuxi itself, not to mention other outrageous adaptations elsewhere. However, these three ingredients is a must to qualify as authentic Wuxi pork ribs. Sugar. Rock sugar is preferred in this recipe. If you can’t get it, use castor or granulated sugar. Chinese Rock Sugar is irregular lumps of crystallized, refined sugar. It forms a translucent and glossy appearance on the pork ribs. The surface will be less glossy if you use regular sugar. Shaoxing wine. Use Shaoxing wine or any rice wine will do the job. 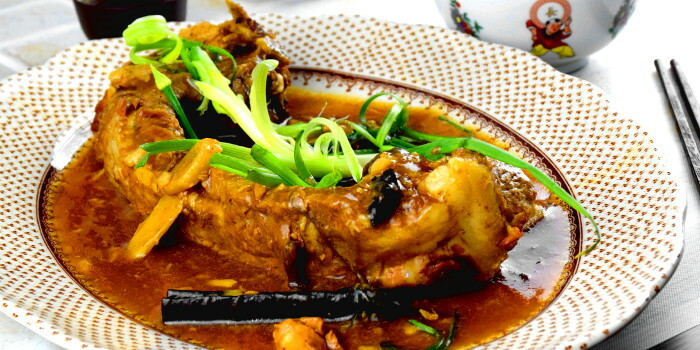 Stir anise and cinnamon are the main spices for braised Chinese pork ribs, Wuxi style. Clove, however, is omitted in some versions. Most of the recipes include a small amount of light soy sauce. Personally, I will not use dark soy sauce as the color of Wuxi pork ribs should be red, not black. 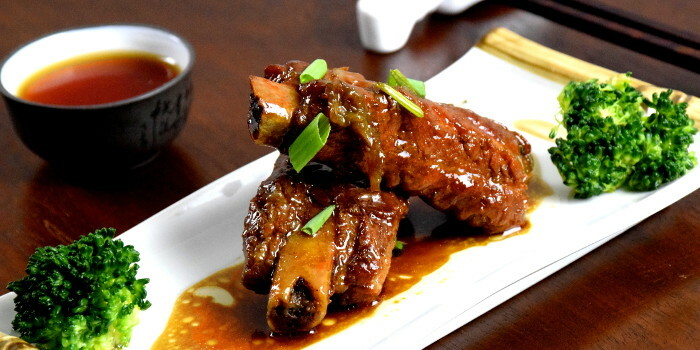 The signature flavor of Wuxi style Chinese pork ribs is from the triumvirate of vinegar, sugar, and wine. These three ingredients is a must to qualify as authentic Wuxi pork ribs. Deep-fried or pan-fried- which is the best pre-treatment for braising? There are three methods to pre-treat the pork ribs before braising them. Deep-frying. I like to deep-fried the pork ribs before braising them. It is convenient for me as my electric deep fryer is on for the whole day in the restaurant. Just place the pork ribs in hot oil for a minute or two until the color starts to turn brown. Strain and set aside. Deep frying adds more flavor to the ribs. This method is great, but I find that it may not be practical at home. The second method is to pan-fry it briefly with vegetable oil, which is what I use it in this recipe. This method is simple, and you do not need to keep the remaining oil. The result is as good as deep-frying. What you need is to add about 1/8 inch depth of oil to a frying pan, or at least if is sufficient to cover the whole pan. Sear the ribs on both sides until the meat starts to shrink and the bone protrude out. When this is achieved, the color will turn a little brown. It is time to remove it and set aside. The third method is called water blanching. This method is suitable for anyone who’s are health conscious and would like to keep the use of oil to the minimum. In this method, the pork ribs are coated with flour and blanch in boiling water briefly. Do not move the ribs during blanching to prevent the flour from falling off the surface. After a minute or two, the flour will form a velvety smooth layer on the surface of the ribs. Remove it and proceed to braise. This is a healthier approach but may be lacking flavor compared to flying it. Add the wine, vinegar, sugar, salt and soy sauce to the pan which holds the pork ribs, spices, and the aromatics. Add water until it is just enough to cover the ribs. Bring the braising liquid to a boil. Then reduce the heat to minimum, which is just hot enough to simmer it. Cover the pan with a lid. Simmer for about 30 minutes. By now the liquid should have reduced significantly. Open the lid and turn the ribs over to ensure even cooking. Add some hot water if the amount is reduced too much. Otherwise, just cover it again and braise for another 30 minutes. Remove the lid. Check the tenderness of the ribs. press the spatula or chopsticks against the meat to check whether the meat is about to detach from the bone. The time required to braise it until this tenderness depends on the heat, which is by large is based on visual observation. Cook for a longer time if it has not achieved the tenderness that you want. Remove the pork ribs. Leave the remaining sauce in the pan. Reduce the volume of the sauce until becoming a rich gravy. Return the pork ribs to the pan. Coat the ribs with the gravy until the surface is shiny and glossy. This Chinese pork rib is characterized by the sweetness of rock sugar, sourness of the red vinegar 镇江红醋 and the flavor from rice wine. The braise is cooked down and caramelized into a thick, luxurious red sauce, enrobed the ribs within. Water sufficient just to cover the ribs in the pan. Please refer to the text of the post for the details of each step. Cut the spareribs into single-bone pieces. Add the salt and marinate overnight. Saute ingredients (B) with the oil in the pan until fragrant. Remove the aromatics. Heat the remaining vegetable oil in the frying pan. Pan-fried the spare ribs over medium heat until golden brown on both sides. Remove and set aside. Add ingredients (C). Bring the liquid to a boil and simmer for one hour over low heat or until the ribs become tender. Add water if necessary. Remove the ribs from the braising liquid. Strain the braising liquid through a fine sieve. Reduce the liquid. Thicken with the 1/2 teaspoon of cornflour. Add the ribs back to the sauce. Coat the ribs with the sauce and reduce the sauce further until it becomes syrupy. Serve. Put the red yeast rice in hot water that is enough to let all the rice submerged. Soak for fifteen minutes. Discard the rice, add only the colored water to the ribs. 11 replies to "Braised Chinese pork ribs (Wuxi style) 無錫排骨"
I have back ribs and would like to braise them in my slow cooker. Have you ever tried this or have any recommendations? I have not used the slow cooker for this recipe. If I ever make it this way, I will do the same as in the recipe but cook it much longer in the slow cooker. The good thing is you do not need to take care of the fire during braising. Sure. There will be more ribs recipe in future. Is there anything I can improve this recipe? Although I’m a vegetarian I can imagine how yummy it is. Where can I buy your cookbook(not e)? I’d like to get one for my daughter. She loves meat. I’m going to KL in April and would love to treat my folks to dinner at your restaurant(address, please!). You do serve vegetarian dishes, don’t you? I do not publish any hard copy cookbook yet. I believe what I can do on my blog is more than a book can do. Hi! Just to clarify, are you saying to marinate with just water and salt overnight? Yes, it is. The reason is overnight marination of salt will cause the salt to penetrate and stay with the meat, even after the treatment with blanching. That gives them meat with the same saltiness even at the thicker part of the ribs. The flavor with being added to the ribs during braising, from the herbs and seasonings. Hi there, point of clarification, are you saying to marinate just in water and salt overnight? Thanks. I have just replied to your the earlier same question. 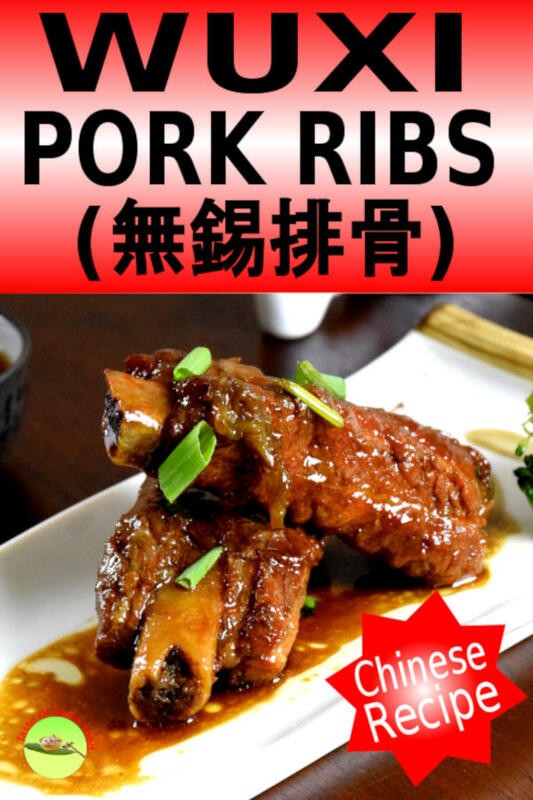 Wish to enjoy the Chinese Wuxi pork ribs.